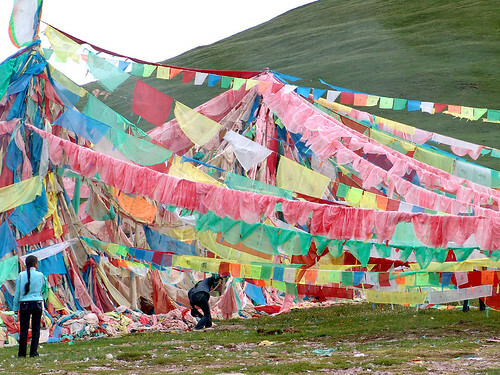 It is common sight in Tibet to see colourful streamers flying from poles, temple roofs, trees, bridges and house tops. 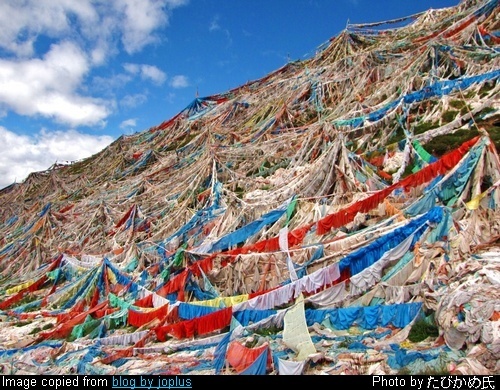 Tibetan Buddhist call these streamers as Prayer Flags and believe that these are links connecting Almighty and man and the wind which causes the fluttering and swaying of the streamers, carries their prayers to Him for His blessings. 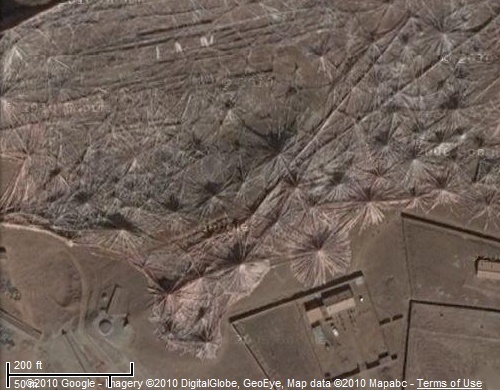 While browsing Google Earth, I recently came across a wide area in Tibet having several hills/mounds swathed with huge streamers. 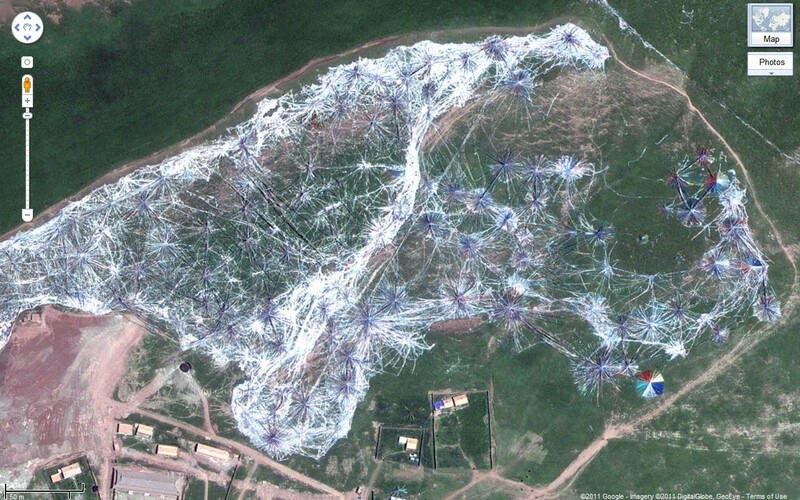 Perhaps it is the largest collection of colourful arrays of streamers at a single place. 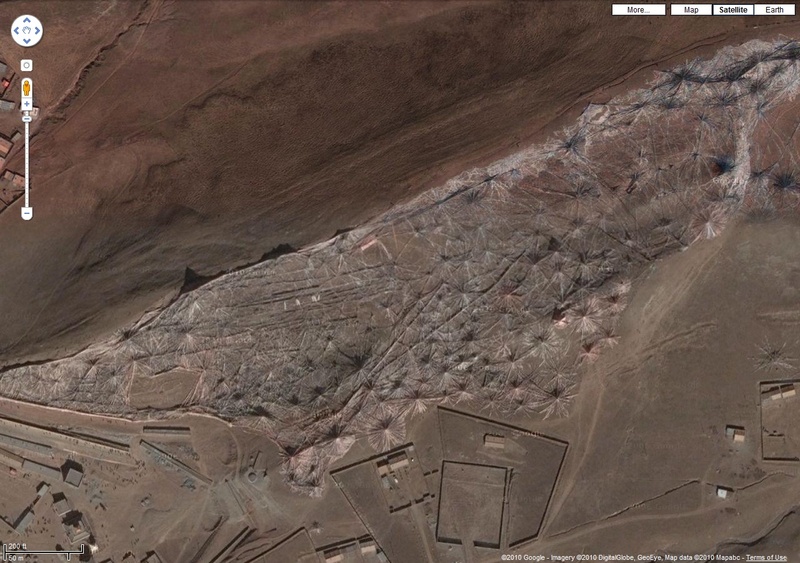 The whole area is about 800 metres (~2625 feet) long and has a maximum width of about 155 metres (~509 feet). These streamers are located near the small town of Machen in Golog (aka as Guoluo) Prefecture. The town derives its name from the Tibet's second highest and one of its most sacred peak known as Amnye Machen or Amne Machin Peak whose elevation is estimated to be 6,282 metres (20,610 ft). Not much information is available about such an huge collection of colourful arrays, however the town is en route to the 195 kilometre (~120-mile) circumambulation of the mountain, which Buddhist pilgrims make each year, and it is likely that these streamers are placed by pilgrims as part of their annual ritual. Image copied from blog by joplus (in Japanese) (English Translation). Photo by たびかめ氏 - Exact copyright status is not known, however permission for re-use is awaited.